It's that time of year again. You know the time where you either owe the IRS or you get back a nice refund? I know very little people who meet somewhere in the middle. I am one of those people who doesn't see the point in breaking even and God forbid I have to pay, so I always receive a refund. Now with that being said, I normally am a saver. I put the money in the bank for a rainy day. With my past experiences in life and crazy stuff always coming up out of nowhere, this has always been very helpful. I have emergency money. Something a lot of people can't say they have. Now taking that one step further, this also means I have never used the money to take that big vacation I see so many people take or buy that new 90 inch flat screen tv that always seems to make its way onto Facebook in that obligatory, "Look what we just bought" photo. 1. A new laptop. My current laptop is considered a dinosaur at this point. Not as old as one would think, but it has definitely slowed down over the years and doing normal day to do things can be a hassle. 2. A spring wardrobe. I feel like I never buy myself new clothes. Not because I don't like to buy new things, but I have the hardest time finding things I life in a price range I can afford. I like to leave a store with multiple items for under a certain amount of money. Using tax money might help me get over that a little bit. 3, A year membership to a fancy gym in my neighborhood. This is a place I cannot afford to pay a monthly fee for currently, but if I could pay for the year up front this would be golden. I mean there is a pool guys..
4. A new bed. Now yes this would be shared with R, but it is something we have been talking about. My last new bed was a hand me down from someone else, and the bed we currently sleep in is over a decade old. It is time for a new bed. 5. Speaking of beds, I have always wanted a really nice sound machine for sleeping. I have a hard time sleeping most nights and R's snoring does not help. Having a nice soothing sound machine would do the trick, or so I hope..
6. A book shopping spree. Let's face it, books are expensive, but nothing pleases me more than browsing a book store. I could leave with more than I need and spend a fortune, but going in there knowing I can spend some money would be so blissful. 7. I would get my car detailed. It's been winter here in the north and my poor black car is pretty white from salt. My car already has a rust issue from its previous owner, so getting it cleaned inside and out professionally would be a great help. 8. Take a class. I am always up for learning something new. Now that Spring is in the air and I actually want to leave my house, taking a weekly class would be fun. 9. Put it towards something for the wedding. As much as I find this option lower on my list, I do know it would be helpful to use some of the money for an expense related to the wedding. 10. Maybe I will just put it back in the bank and hold on to it.. probably not the best idea but it still has crossed my mind just in case. 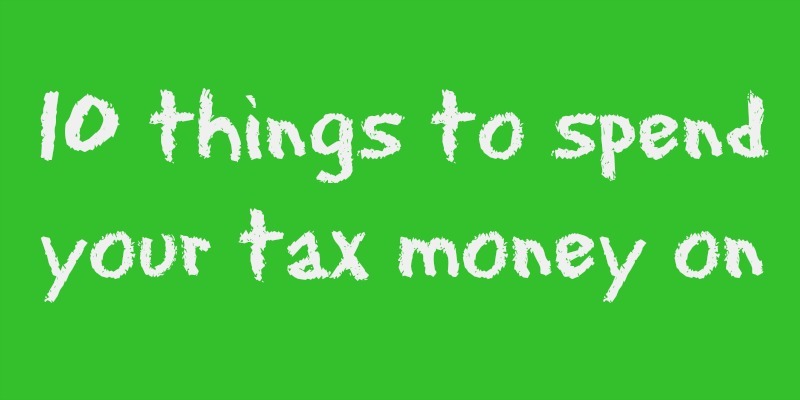 What do you plan to do with your tax money? Are you a saver like me or does the money burn a hole in your pocket as soon as you get it?